The luxuriant aluminum and high-quality ABS bring out the true beauty and exquisiteness of iClever wireless keyboard mouse. The streamlined keyboard is thin, lightweight and ultra-portable. Toss it in your bag so that you’re ready to work anytime and anywhere. You’ll enjoy 99 function keys, including conventional number keys for effortless typing. If you are on the go, you’ll probably want something more durable and get rid of all the wires. Fortunately, iClever wireless mouse keyboard boasts significant battery running time and engineers with rechargeable battery (280mAh) offering up to incredible 90 hours working time on a single charge of approximately 2 hours while powerful 2XAAA battery is implanted in the mouse with 1-year running time. What are you waiting for? Serious work needs a proper keyboard — tailored for the person just like you! Portability is the name of serious typing work when it comes to wireless keyboard. iClever wireless keyboard and mouse is very slim and easy to transport. Being only 2/3 the size of a standard keyboard, you won’t have any problems sliding it into a backpack or a suitcase when you are on a business. Whether you are on a business or travelling, just feel free to use it. 2-in-1 wireless Nano receiver allows your keyboard and mouse to be connected at the same time. Simply plug the receiver into your laptop or desktop and get to work! (Note: the receiver is contained in the back of mouse). Under Windows systems, the number keys work when the NumLK key is on while the functional keys (Home, End, PgUp, PgDn and arrows) serves when the NumLK key is off. Under Ubuntu system, the number keys can be inputted unless the NumLK is off when you need to enter a password at first. After entering the system, the number keyboard will come into normal operation like in windows systems. 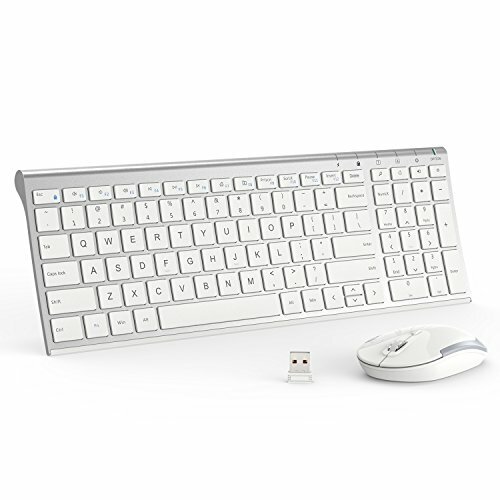 STABLE CONNECTION & SATISFYING SERVICE - iClever wireless keyboard and mouse combo with 2.4GHz technology enables you to experience ultimate wireless stability and transmits data quickly while eliminating skip frames. You can connect the keyboard and the mouse to your device in a flash-no pairing required! A generous 33 feet connection range lengthens the using distance in a more generous way. Compatible with W7/8/10/XP. It works great for desktop, laptop and other devices. Any questions please feel free to contact us. You are sincerely entitled to enjoy 30-day money back, 18-month replacement warranty.